Two weeks ago, I had the pleasure of going to an apple grafting course run by the North Cumbria Orchard Group and The National Trust at Acorn Bank near Penrith. It was a fun day out in beautiful surroundings run by some very knowledgeable people who were very willing to share their wisdom and teach us new skills. I came away with eight newly grafted apple trees and full of anticipation for how they would turn out. I heard about the course through Tom and Ros, who I’d met at the Hexham Farmers’ Market on Apple Day: They were identifying apples on one stall, while TT were pressing them on another. Tom and Ros are a mine of information, and are keen apple growers despite living in the windblown heights of Weardale. They also very kindly came up to Hexham after apple day to identify the apple trees in the Leazes Lane orchard. They identified 17 of the 19 trees. I thought it would be a good idea to propagate some of the trees we have and so perpetuate our local branch of the varieties. I realise that I can just go and pick up any of the varieties we have from a fruit grower, but I couldn’t resist the sentiment of continuing our local heritage by using our own 80 year old trees. When Ros told me about the grafting course at Acorn Bank, and I signed up. A couple of days Before heading out to Acorn Bank, I went up to the orchard to cut some scion wood. Scions are branches of the apple tree that you want to grow the fruit from. They must be a cutting from the last year’s growth of the tree, and preferably be as thick and healthy as possible. For those of you who have seen the Leazes Lane orchard, you may appreciate that it isn’t that easy to find healthy new growth. Most of the trees are massive with branches towering overhead. Those that are not so big tend to be dilapidated, and don’t have much new growth at all. But I managed to get some twigs from most of the varieties we have. I had no idea if they’d be suitable though. The course was introduced by Chris, the head gardener at Acorn Bank. 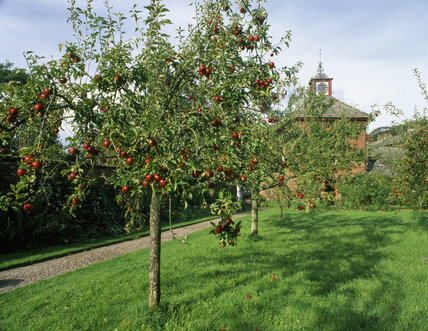 He’s been working there for 30 years, and has been instrumental in developing the beautiful gardens; full of many different varieties of apple trees as well as other fruit trees. Its a great place, and I’d certainly recommend a visit. Maybe in Spring when the blossoms are out, and its a bit warmer! It hadn’t occurred to me before, but just as an edible variety that we propagate through grafting are clones of the original tree grown from seed way back when; these standard root stocks are also clones from the original apple trees that were discovered at East Malling for use as a root. Hilary told us that as well as the root stock controlling vigour, the scion will also affect growth. A very vigorous scion will grow much more on the same root stock than a slower variety. A mismatch in root stock to scion will often result in a enlarged joint between the two. This led on to the subject of triploids. Triploids are very vigorous apple trees. The most famous example being a Bramley. But although they are vigorous growers, triploids are not good pollinators. They therefore need another apple tree in close proximity to pollinate it. And as the triploid won’t be able to pollinate the second tree either, you need yet another tree the pollinate the second. I’m sure its worth it for the apple pie though. Mr Helmsley mentioned that its important to leave enough rootstock trunk to prevent the scion from developing a root that bypasses the rootstock. Be sure to disinfect secateurs and knives before use. You can use meths, citric acid, and even jeyes fluid. Chris had bought some special horticultural sterilising fluid. Scions should be cut to 4 buds. Grafting wax can be made from normal wax and linseed, but again, you can buy specialised wax. Grafting wax melts at low temperatures, so won’t harm the tree. When the scion is smaller diameter than the root, cut a sliver off the root stick to the same width as the scion. It is very important that the cambium layer of the scion and rootstock match. You can match just one half if pushed, but its better to get a union on both sides. After the scion and root is grafted, wrap in grafting tape. I’ve since seen videos on grafting and I think you can get away with plastic bags cut into strips as tape. Leave the tape on until June, by which time the graft should have established. Only let one bud grow. This is usually the topmost, but if that fails, let the second or even third grow. Let the lower buds grow until you’re confident about having a leader. I went across to the course with Jo, a fellow Transitioner and active member of the food group. She chose some older varieties, but I haven’t heard from her as to how they’ve gone. When I hear, I will post back. If you ever get a chance to go on a grafting course, then I would fully recommend it. I think its amazing that its possible at all, and that I can do it with my complete lack of horticultural knowledge is a great surprise. From now on, for the same price as a beer for the rootstock, and some time, I’m fully equipped to propagate apple tree after apple tree. I just wonder where I should plant them all! Next ›Two renewable projects that you can invest in. This sounds great Pat ! I am sure we can find places to plant the young trees – Edible Hexham for a start – get propagating more !